Find hotel near Elephant Safari Park Taro .. If you want to enjoy a romantic accommodation while touring in Bali, Indonesia, you can certainly mark your stay in the Elephant Safari Park Taro-Bali. It is a 5-star hotel that offers services full of luxury like no other. The environment of the place is organically decorated, and you can spot lots of elephants here. The place has a lot of greenery and swimming pools. Here you can also enjoy the full rejuvenation of body and mind by availing spa and body massage from expert professional masseurs. The boutique hotel offers rooms that are regally furnished and decorated. You can get great food and drink at the facility’s restaurant and an elephant ride will give you a lifetime experience for sure. Personalize your visit to the city by chalking out a plan using Bali trip planner. You won't miss your home when in Bali, hotels in Bali like Alas Petulu Cottages, Capung Cottages and The Peacock Inn offer some of the best places to stay in the city. Create your own Bali vacation packages or choose from the ones made by travel experts. Also explore the best ways for how to reach Bali. 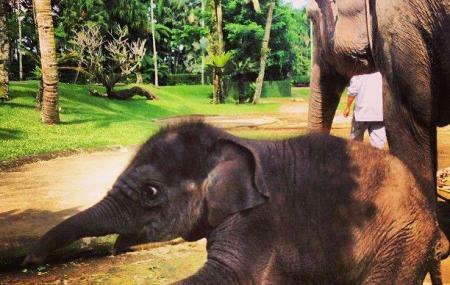 How popular is Elephant Safari Park Taro-bali? People normally club together Tirta Empul and Bali Adventure Rafting while planning their visit to Elephant Safari Park Taro-bali. A nice place to visit. You can ride an elephant and feed them there is a nice restaurant serving a great selection of food and drink. Interesting museum with the history of the place. You can stay there and he rooms looked really good. Only downside was the elephant show which did not show the elephants at their best and was a little reminiscent of a circus. However the elephants are all well looked after and seem to enjoy what they are asked to do. It was a great experience. (I went only for the safari, did not stay at the lodge) Prices were a little steep though the biggest reason I would pay for it is so that the elephants actually get proper treatment with sufficient profits to run the place. The entire place is really only worth it if you take the ride otherwise its just the ability to feed them up close and walk around the area near to them. Nonetheless, a great experience for kids to be close to elephants and they've got a pretty amazing collection of artifacts and art gallary in the place. Elephant park is great place to come visit while in Bali. They treat the elephants very well and they also have a restaurant and a gift shop. The people there were very friendly and informative about the elephants. It's a nice fit for everyone. Very professional and caring staff run this excellent facility. Elephants take center stage here but amenities abound from an excellent breakfast offered and informative museum. These rescue Elephants seem very well cared for and it’s nice to be able to support the zoo knowing these elephants were all rescued (most from Sumatra) from horrible conditions.